Upright Indian Forest Service official, Sanjiv Chaturvedi on his disappointment with the Modi government. 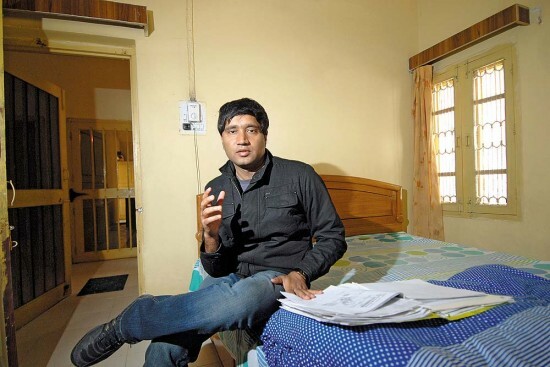 Ever since the Ramon Magsaysay Foun­dation awarded Indian Forest Ser­vice officer Sanjiv Chaturvedi with its eponymous award for ‘emergent leadership’, there’s been a telling silence from the politician and bureaucrat ranks who regularly hounded him over his exposes of corruption in high places. 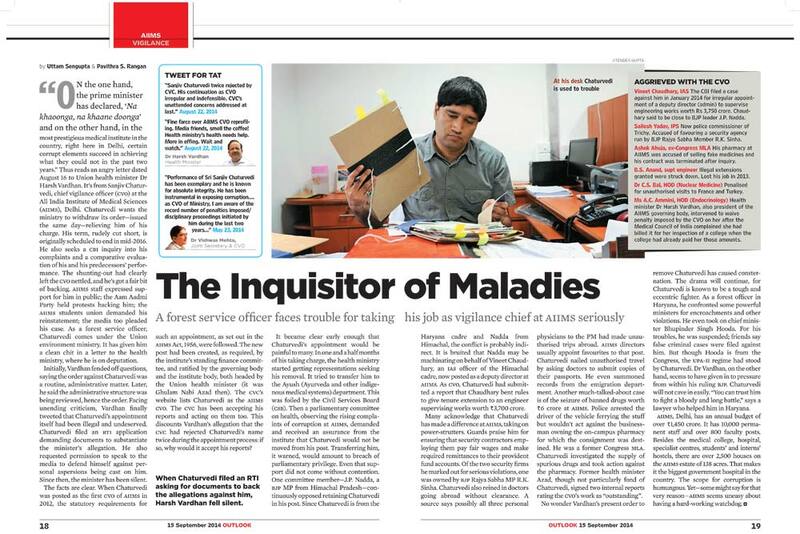 Chaturvedi, who was removed as chief vigilance officer (CVO) of the All India Institute of Medical Sciences (AIIMS) in August 2014, moved the Central Administrative Tribunal last month, alleging that he was being victimised by the Union health ministry. 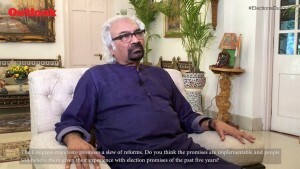 In an interview with Chander Suta Dogra in Chandigarh, Chaturvedi, 40, explains how his “legitimate expectations” from Prime Minister Narendra Modi were shattered. Like many people, I took the PM’s election slogan of ‘Na khaoonga, na khaane doonga’ at face value and act­ually believed he is the anti-corrupt­ion messiah we were waiting for. I am hugely disappointed. There is zero tolerance for honesty in this government. Last August, when I was removed as CVO for initiating action against powerful vested interests, there was hue and cry. I later learnt through an RTI that the PM had on August 23 asked for a report concerning my removal from the Union health ministry. I also procured a copy of the same and was appalled to find that it contained blatant lies about my appointment—that I was removed beca­use it did not have the approval from the governing body or the institute body of AIIMS. On seeing this, I sent the prime minister a counter-report with full documents detailing the nexus in AIIMS, with motives and facts, who are the politicians and bureaucrats involved and requested for a fair investigation. In October, the PMO asked the health secretary for comments on my communication to him, and when these did not come, in February a reminder was sent. If the PM had personally intervened in a matter to learn what has happened, I had a legitimate expectation that the matter would be brought to a logical conclusion by now. Either I am wrong or the nexus that I tried to expose is guilty. I had informed the prime minister officially about how I was harassed. Last September, I had sent him the letters written by present health minister J.P. Nadda (before his appointment) asking for my removal and curtailing of the investigations I had initiated. 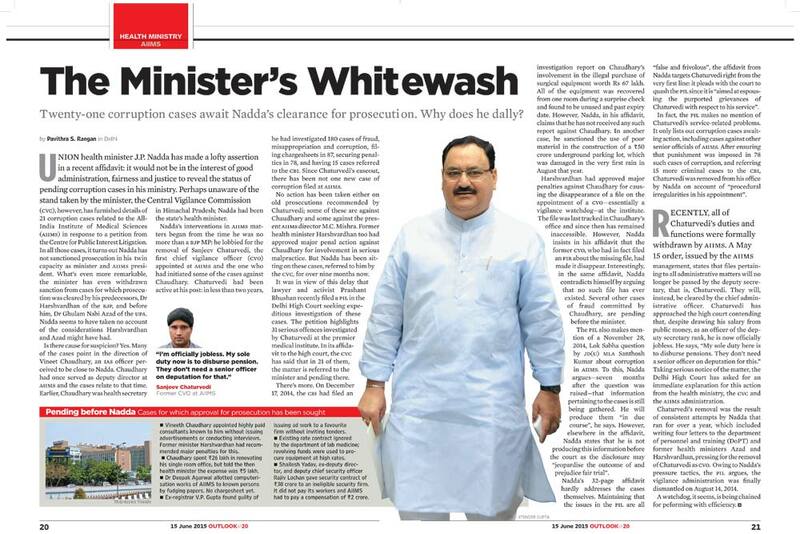 Instead, Nadda was made my minister, in which capacity he not only supervises my annual confidential reports (ACRs) but is the disciplinary authority in all those cases which he was demanding be closed. This is a perverted sense of justice. Under the circumstances, what’s happening to me was inevitable. What is happening to you now? The Haryana government gave you a promotion after the award. I didn’t get it because of the award, but because I moved the Central Adm­inistrative Tribunal (CAT) for a time-scale promotion that is rou­tin­ely given at 13 years. My batchmates got it in January. Am I wrong in concluding that the combined harassment by the Hary­ana government and the health ministry has the blessings of the highest quarters? 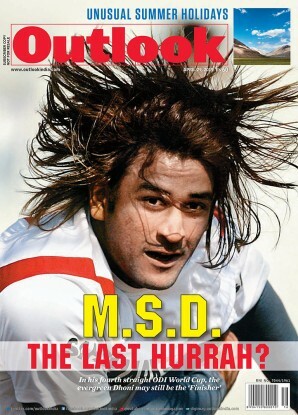 How has life changed after this int­ernational recognition? On a personal level, there is no change. No officer from AIIMS congratulated me, not even the director or anyone from the health ministry. The only two prominent people to call me are a minister from Haryana and Delhi CM Arvind Kejriwal. But my staff at AIIMS and many ordinary people who I do not even know more than made up by their enthusiastic celebration of the award. You have powerful opponents in power, how did you survive so far? I have received help from the most unexpected of places and people in my several battles with the government. All it takes is one honest person toiling away at his desk to tip me off about an impending action from the powers that be, or help out with well-meaning advice. Deep down, even the corrupt want a corruption-free environment. I have never done anything expecting awards. I knew the implications whenever I opened a file on a powerful person. You are a deputy secretary at AIIMS with no major duties. In February, Delhi CM Kejriwal had asked for your services as his OSD. What is the hitch? The manner in which the government is handling this matter is a classic case of how files are moved when it does not want to take a decision. When they wanted to remove me as CVO, it took just 24 hours to get 20 signatures on the file. Now, even though I fulfil all the conditions for going on deputation—mini­s­try officials have informed the gover­nment of this—six months have passed. What is the biggest challenge in fig­h­ting corruption nowadays? For officers like us, it is when you come into conflict with higher-ups in the political establishment. All the disciplinary powers, to transfer, write our ACRs or chargesheet us are with them. The All India Services still provide some protection, but subordinate ones like state civil services are very vulnerable. In the states, two things have collap­sed in recent times. One is fairness in appointments as exemplified by the irregularities in the Vyapam scam. It breeds extreme discontent among the youth. Secondly, the anti-corruption machinery in the states has become defunct. The aam admi is most aff­ected by lower level corruption. What about juniors who might want to follow your example? It’s a tough road but I believe that the battle against corruption has to be fought; it’s like the freedom movement all over again. Many more people will have to make sacrifices to end it. It is not just limited to bribery and speed money but has begun to hit at the dignity of the aam admi, his hopes and dreams. Is a corruption-free India possible? Sometimes I lose hope, but then I think that this a journey that other developed countries have already made. The manner in which honest politicians are getting support across caste and communal divides is telling us something. Nowadays, even a corrupt person wants a clean candidate. But the corrupt outnumber the honest officials in government. If we somehow manage to reach a critical number like say 30 per cent or so, then it will become difficult for government to stifle our voice. I am already consulting like-minded people to create something that works within the system to improve it. It may involve working with schoolchildren and probationers. I take strength from an SC judgement which says that though a civil servant is bound by service conditions, he/she does not forfeit the rights as a citizen and can intervene in matters of public interest, independent of what you may be req­uired to do as an official.